The a-la-carte dining in the Members Dining Room on event day sees members and guests able to enjoy an amazing offering. The menu includes four choices of entrees, main courses and desserts, afternoon tea, an extensive wine list and superb views of the MCG and back into the city. In fairness to all, the club uses a ballot system for members wishing to make bookings in the Members Dining Room for events at the MCG. Registrations for the ballot are typically taken online or by phone (03 9657 8888) from 9.00am on the Monday two weeks prior to each event until 5.00pm the following day. The Members Dining Room is also a popular room for conferences, seminars and presentation nights. 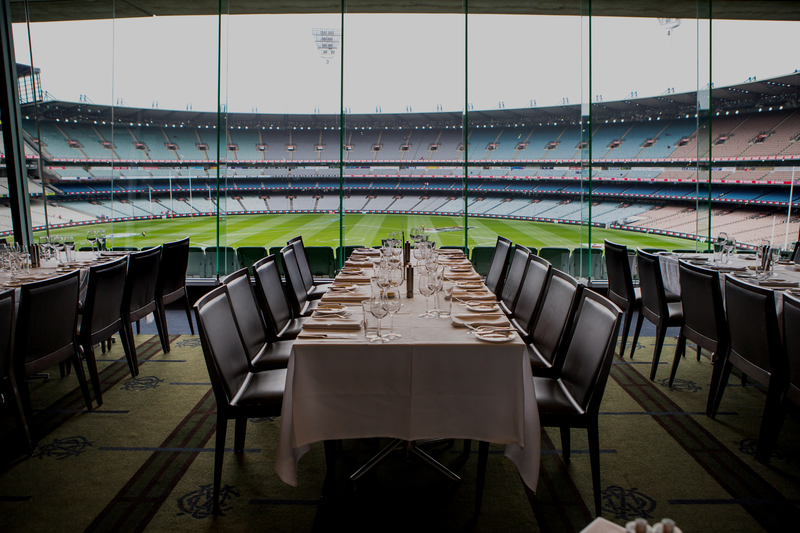 Members can only register for either the Members Dining Room or Jim Stynes Grill for each match. The club will advise the number of guests permitted per member prior to bookings opening for each match day. Members must ensure they have purchased visitor tickets in advance for blockbuster matches, as dining bookings do not guarantee entry to the Reserve if visitor tickets sell out. Members successful in the dining ballots who have purchased reserved seats may contact the club for a refund of the reserved seat component of their tickets. Members must contact the club prior to 5.00pm on the last business day before the match to obtain a refund. A $20 “no show” fee applies for members and/or guests who do not attend. Cancellations must be made before 5.00pm on the last business day prior to the match by phoning (03) 9657 8888. Bills will not be split for credit card payments. The maximum number of people in any one booking is 20. Children may enter the dining rooms so long as they are accompanied and adequately supervised by an adult and neatly dressed. Walk-up dining will only be available if either room has not been fully booked in advance. A main meal must be purchased when dining. Members requesting mobility seating please note, in order to accommodate all those requiring mobility seating, particularly for blockbuster matches, the allocated seats for your group may be split across two seating bays.